If you love shag dancing, appreciate golf or just want to be closely located to the white sandy beaches, then you need to make reservations for Ocean Keyes Beach Villas. This North Myrtle Beach resort is just a block or so away from Main Street in the Ocean Drive section of North Myrtle Beach, South Carolina. That puts you and your friends or your family within walking distance of some popular beach clubs that feature live beach music and shag dancing. Ocean Keyes Beach Villas is also near more than 100 Myrtle Beach area golf courses. So dust off those golf clubs and pack them in the car with your bathing suit. The beautiful beachfront of North Myrtle Beach is less than two blocks away from the entrance of this North Myrtle Beach resort. It will take you less than five minutes to walk to the beach from your comfortable surroundings at Ocean Keyes Beach Villas. Ocean Keyes Beach Villas is part of a stunning North Myrtle Beach resort that is within walking distance to the famous beach clubs and the gorgeous beachfront. Ocean Keyes Beach Villas are spacious condominiums housed in four-story buildings. These buildings are spread out around swimming pools and among ponds and near a peaceful lake. 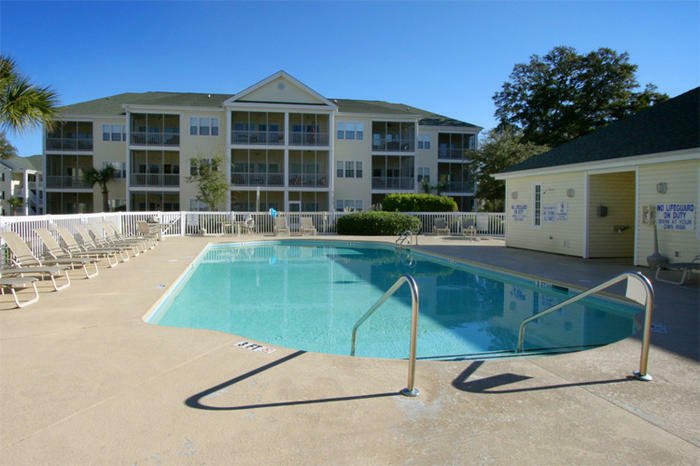 This North Myrtle Beach resort has a handful of North Myrtle Beach condominium rentals for you to consider. There are really spacious three-bedroom North Myrtle Beach vacation rentals that each have two baths and sleep eight people. There are also two-bedroom North Myrtle Beach rentals at Ocean Keyes Beach Villas that also have two baths and sleep six people. All of the North Myrtle Beach vacation rentals at Ocean Keyes Beach Villas have a private, screened porch that is furnished so you can fully relax during your North Myrtle Beach vacation. This screened balcony is accessed through the living room, which features one wall of windows so the sunshine comes inside. The balcony is a wonderful place for you to start your North Myrtle Beach vacation day. Take a fresh cup of coffee to the balcony and plan your vacation day. Leave the balcony door open and welcome in the fresh air. Some of the three-bedroom condos in North Myrtle Beach, South Carolina feature a master suite that has balcony access, in addition to the sliding glass door found in the living room. These extra-large balconies are quite luxurious and make your North Myrtle Beach vacation stand out. Elliott Beach Rentals is not affiliated with onsite management or the HOA of Ocean Keyes Beach Villas.